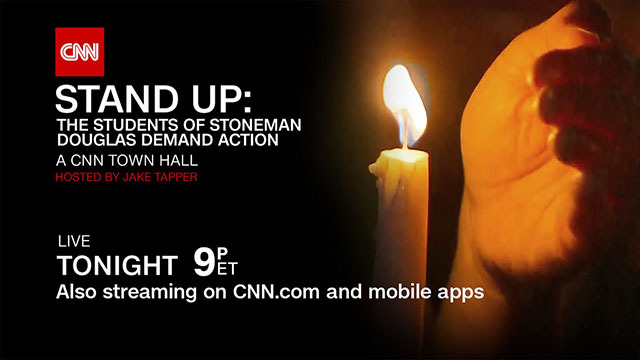 CNN will live stream “Stand Up: The Students of Stoneman Douglas Demand Action” live Wednesday, February 21 from 9-11 p.m. ET to CNN.com’s homepage and across mobile devices via CNN’s apps for iOS and Android. The Town Hall can also be viewed on CNNgo, which is available at CNN.com/go on your desktop, smartphone, and iPad, plus the CNNgo app for AppleTV, Amazon Fire TV and Roku TV devices, no login required. You can listen to the Town Hall live in its entirety on CNN or your Amazon Alexa and Google Home devices — just ask to play CNN on TuneIn.